Files – repositories of uploaded data items (docs, pdfs, spreadsheets, images, etc. ), each having a permalink or URL. Forums – discussion threads, where members investigate topics, form opinions, post attachments, and tag content. Docs – a private wiki-like space where members collaborate on documents. Permissions and visibility are configurable. I would like my site to be visible only to Admins. 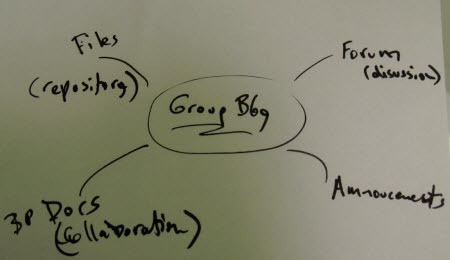 But group members may not be aware they can create posts on the site, and be unsure of the site’s privacy level. It may make sense to note these settings in your site’s “About” page. A successful group site often acts as a hub, linking out and annotating content from its forums, BP Docs, Files, and Announcements, as well as soliciting contributions in the form of posts, pages, and comments from its members. Each group is different, and group admins need to decide how best to control site content. WordPress now has custom menus, and these can be used to create navigation that links out to the group content. Each discussion thread, each doc, each file, and each announcement has a permalink which may be used in a group blog’s post, page, or sidebar. Custom menus are a great way for admins to bring group content together (see tutorial at the end on this page). Both admins and members can take advantage of the built-in WP presentation tools, and available plug-ins to embellish content on the site. This can bring a cool dimension to a group site. Experiment with Google Calendar, Contact Form 7, Twitter Tools, and many other plug-ins to see how your group can benefit from a group blog! And check out Wiki Inc plug-in which lets you include content from any MediaWiki based site, like Wikipedia.